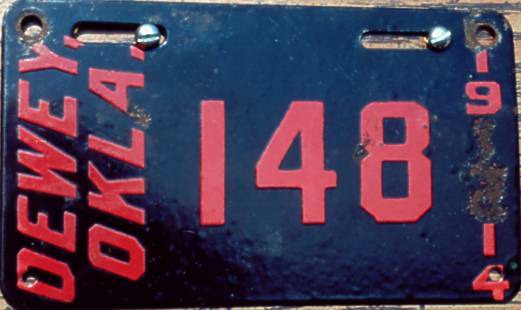 well as livery plates from Tulsa and Bartlesville. was discontinued half way through its intended life span. showing that the cities are clustered together in a few regions of the state. 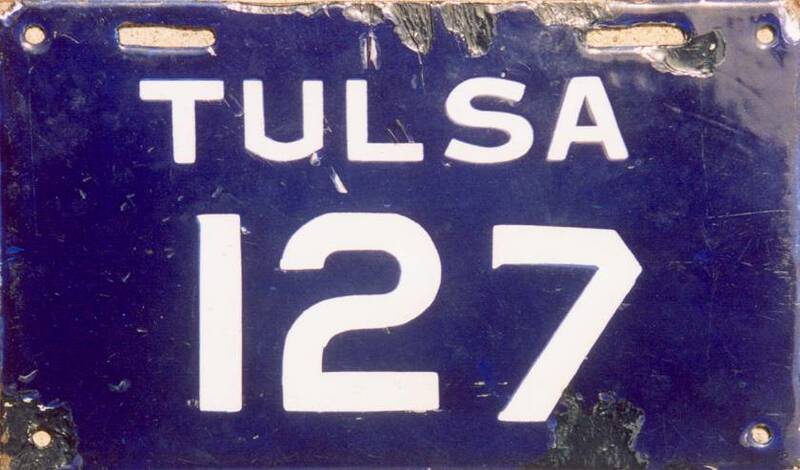 route south of Tulsa, for instance, has both Sapulpa and Okmulgee on it. there are huge regions of the state from which we know of no porcelain plates. between 1910 and 1915. 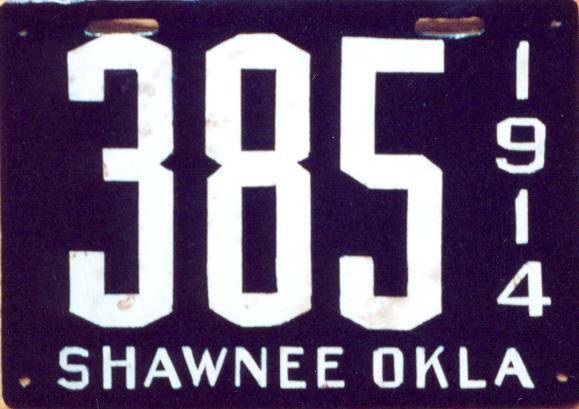 Numerous dug plates are also known from Shawnee. Beyond these exceptions, however, Oklahoma porcelains are exceedingly rare. 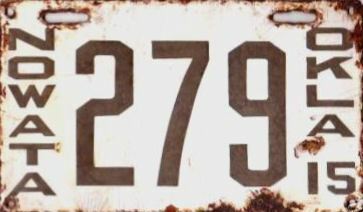 plates of the same era. from all years combined currently known in collectors' hands. In the rich oilfields about forty miles north of Tulsa sits the town of Barnsdall. Railway in 1905. 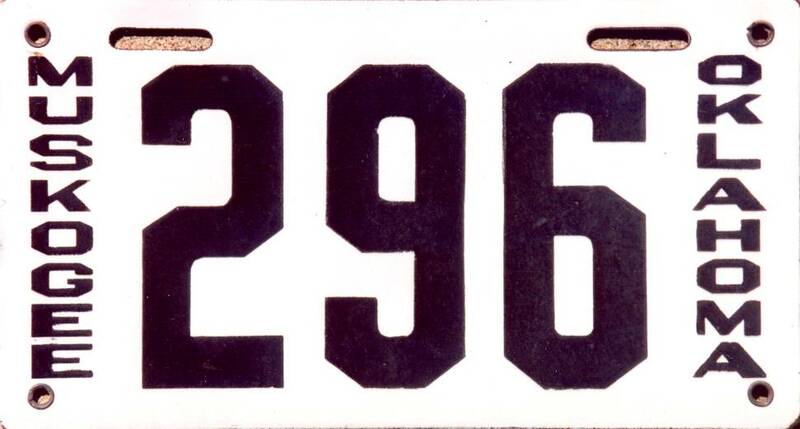 Surveyed and platted, land lots were auctioned in 1906.
the city's early issuance of license plates. in honor of an early Native American community in the area of the same name. 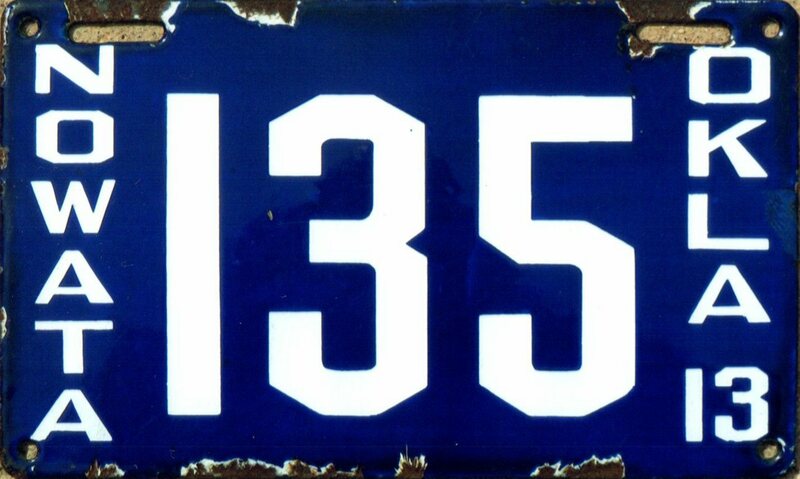 when an advertising campaign unearthed the first and only known 1913 plate. 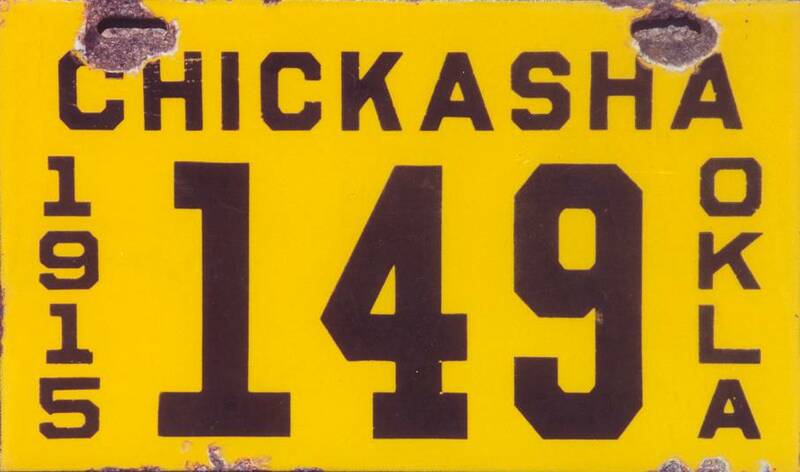 approximately a dozen total plates known from Chickasha. years are entirely different in layout and color and are extremely rare. country North of Tulsa. It was created in 1892 and renamed Dewey in 1899. 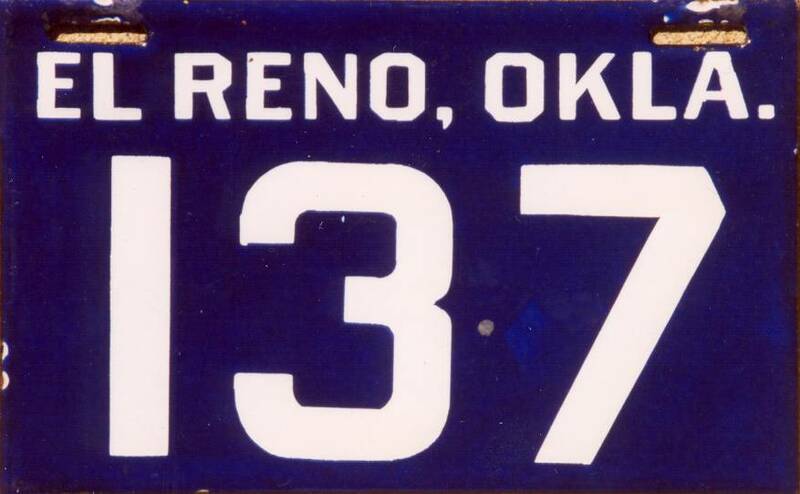 Reno became a rail center for the productive wheat harvests of Canadian County. occurred sometime in the 1910-1915 era. 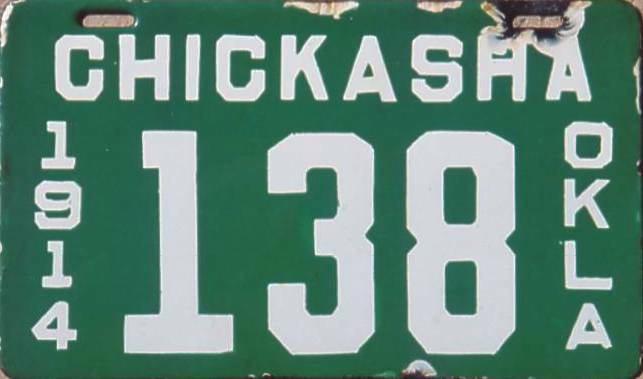 The Osage County community of Hominy is situated in the Tulsa Metro area. history of automobiles in the small community. booms. 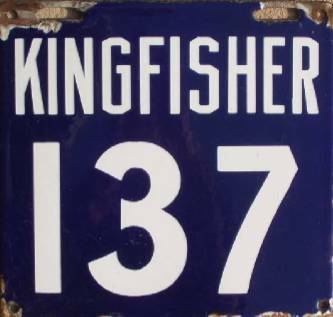 Around the turn of the century the slogan "Buckle of the Wheat Belt"
least four known surviving examples of these large Kingfisher plates. town in Southwestern Oklahoma, just West of Hobart. 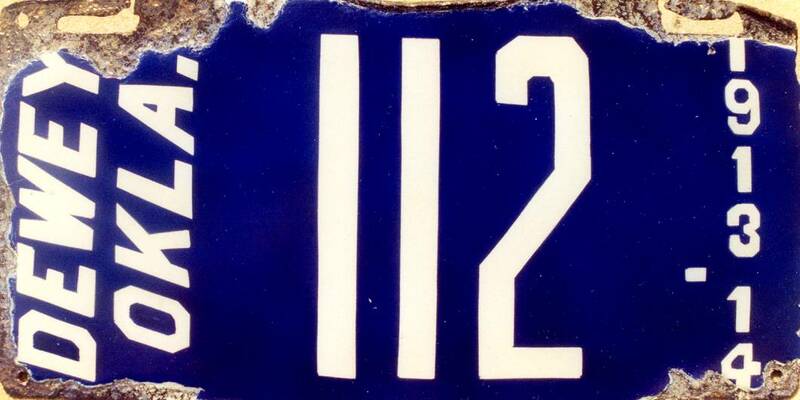 The final issue was a 1914-1915 plate, which is known in two distinct varieties. 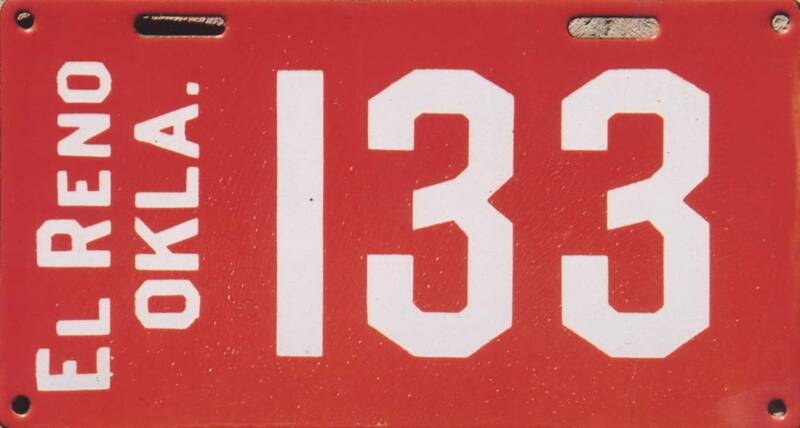 The first style has much taller numbers and different slot hole arrangement. These are marked on the reverse with the oval seal of the Baltimore-based J.F.W. 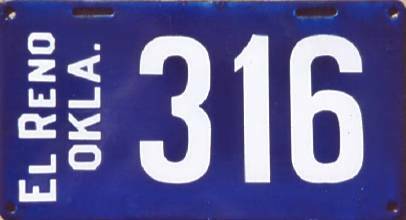 for license plates at that time which were reprinted in the city's "Times Democrat"
been ordered from a different manufacturer. surviving 1914 in collectors' hands. United States Civil War. 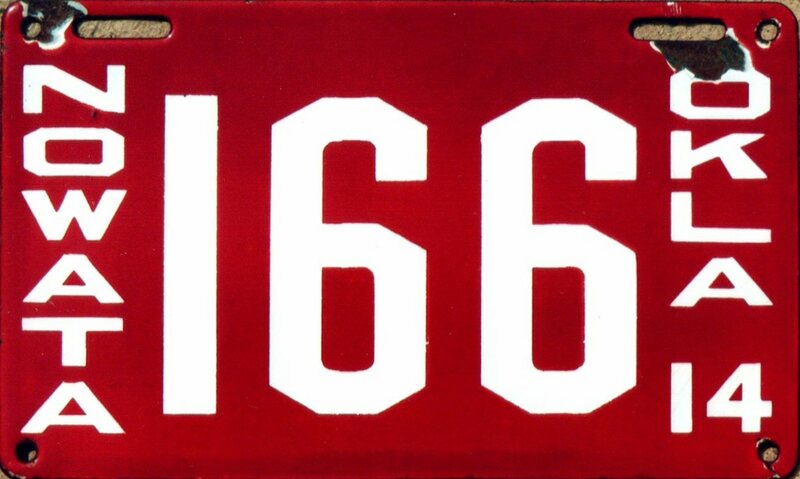 The city is known to have issued plates in at least 1914. 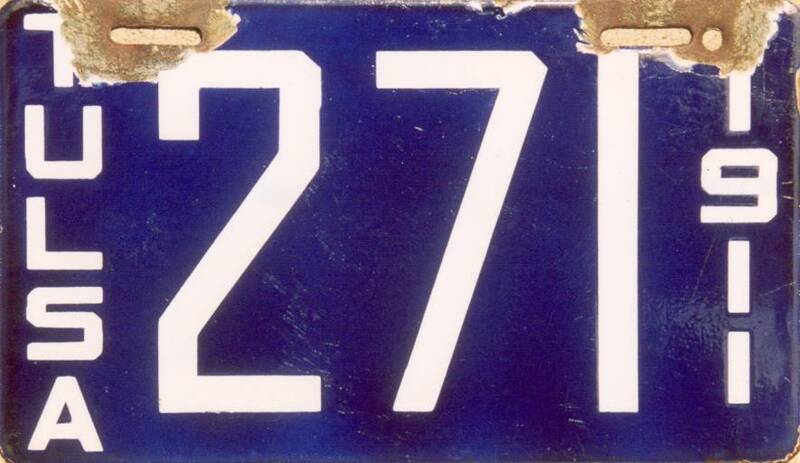 There are only 2 known surviving examples of this tough plate. porcelains to carry a border. 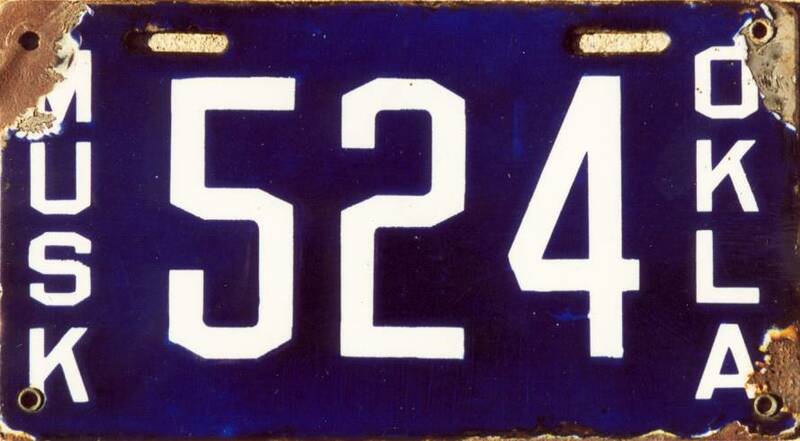 porcelains issued from jurisdictions such as Kansas City, Independence, and St.
5000s, suggesting that perhaps the city began its run at #5000.
midst of a boom that came close to keeping pace with nearby Oklahoma City. 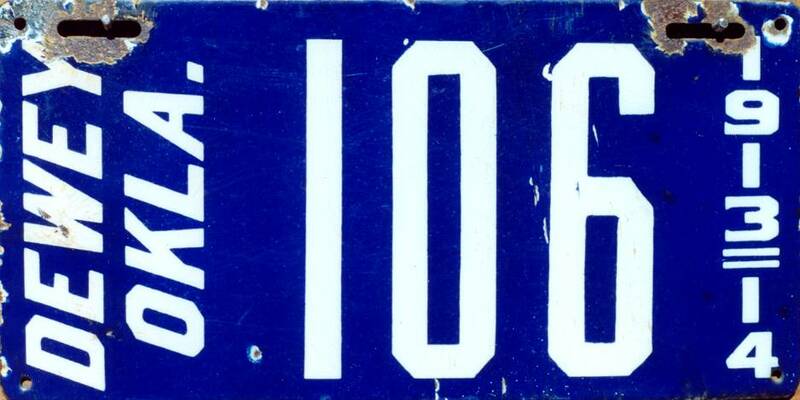 1915 issues took up where the 1914 plates left off. 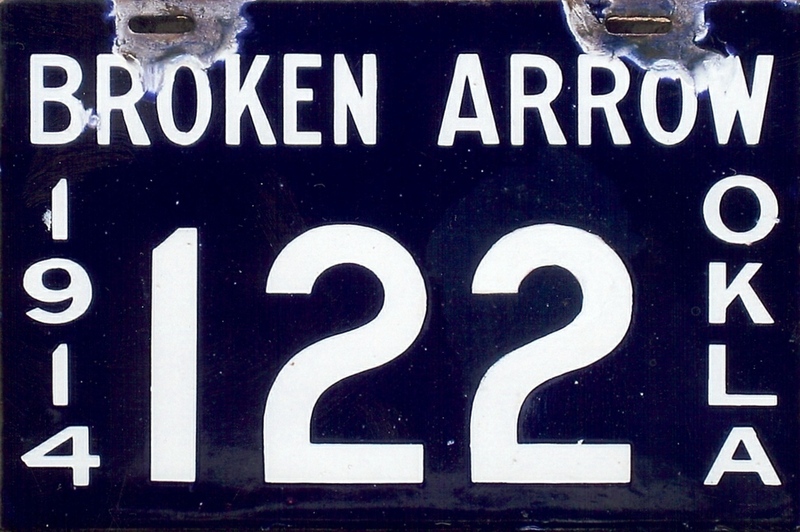 Indian Territory, this agricultural community had roughly 1,500 residents in 1910. 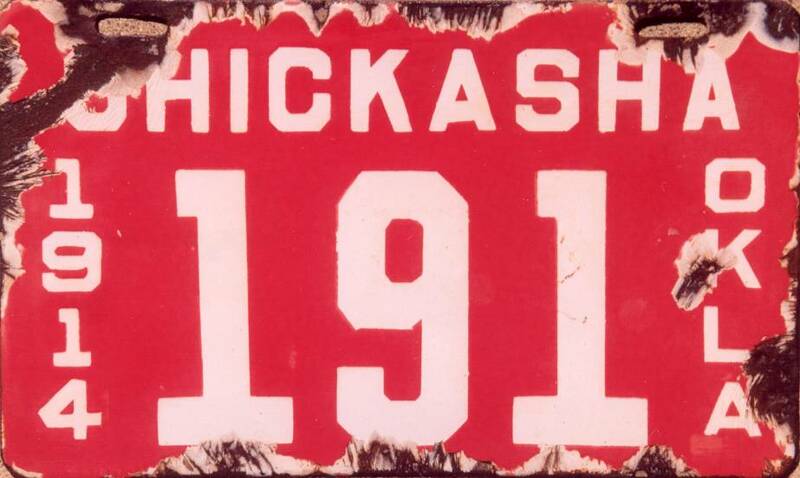 The only known license plate from Stigler is a 1913 issue. porcelain run. Only in 1914 did numbers finally appear to have surpassed 1000. #1035, strongly suggesting that the livery run may have started at #1000.
were reserved for non-passenger classes. County. Established in 1871, Vinita was the first city in Oklahoma with electricity. were on the roads, fewer than 5,000 residents lived in Vinita. 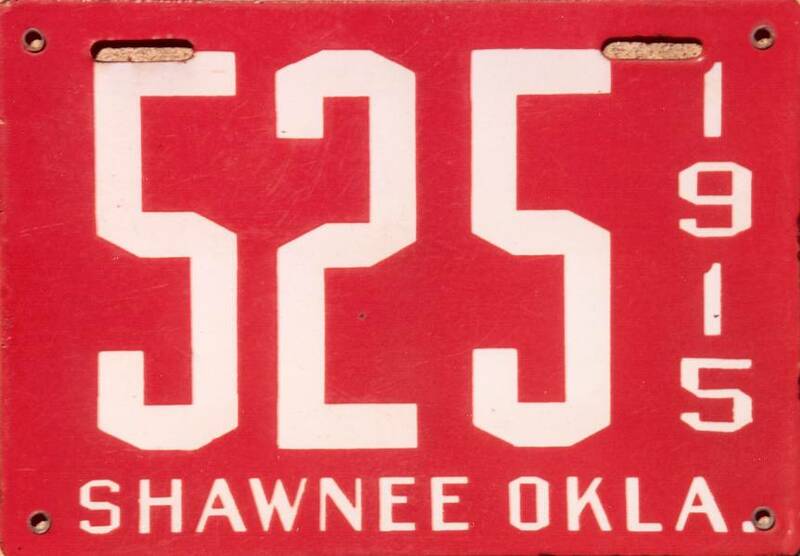 Wagoner's census was 3,372, making the fourth largest town in Indian Territory. 1911 Cordell and undated Perry - carry a border. 5 3/4" x 10 3/4"
7 1/2" x 15 3/4"
6 1/2" x 14 3/4"